What would the holidays be without another movie in which the quirky members of a dysfunctional family come together to sort out their personal neuroses and realize that, doggonit, they love each other? To say this kind of thing has been done to death would be an understatement. Even more, it's a concept that's rarely done well. Love the Coopers makes some bold choices in its effort to put a fresh spin on a stale idea, and while some of those choices fall seriously flat, there's undeniable nobility to the attempt. The central characters are Sam and Charlotte Cooper (John Goodman and Diane Keaton), a couple who are considering ending their marriage – but not until after the whole clan gets together for Christmas. Their various family members each have some kind of domestic drama. Charlotte's sister Emma (Marisa Tomei) gets busted for shoplifting and ends up bonding with the arresting officer (Anthony Mackie). Her father Bucky (Alan Arkin) is distraught to learn that his favorite diner waitress (Amanda Seyfried) is planning to move to another state. Son Hank (Ed Helms) can't bring himself to tell his estranged wife that he's lost his job, while romantically-confused daughter Eleanor (Olivia Wilde) is so afraid of disappointing her parents that she convinces a soldier she meets in an airport (Jake Lacy) to come home with her, pretending to be her boyfriend. Love the Coopers takes kind of a different approach to this material. For starters, there's a heavy use of narration (provided by Steve Martin as...well, wait and see) that clues you in to the characters' internal motivations. Director Jessie Nelson (I Am Sam) also relies on flights of fancy; this is the kind of movie where the narrator announces that one person is “shattered” by an event, and you then see that person turn to ice and literally shatter onscreen. The first of those gimmicks is sometimes useful, other times unpleasantly intrusive. The second is just annoying. Much more successful is a third invention, which is showing the Cooper family members' memories of themselves in their younger years. Sam and Charlotte reminisce about the early days of their romance, Emma remembers feeling competitive with her sister as a child, etc. Sometimes these moments take place in the form of flashbacks, while other times the earlier iterations of the characters appear in the background of scenes taking place in the current day to emphasize a point. Love the Coopers is not so much a Christmas movie as it is a movie that takes place at Christmas. The story uses the holiday to suggest that it's a time of year when people take stock of their lives, their successes, and their mistakes. That's an idea that really works here, and which helps offset the irritating nature of the narration and dream sequences. The movie effectively depicts a group of people trying to figure out how they got to the unexpected places they are in life. As with any movie of this sort, some of the subplots are more interesting than others. The whole bit with Emma and the cop, for example, feels much too forced and trite. It also falls victim – as do a number of other scenes – to dialogue that sounds like the creation of a presumptively witty screenwriter rather than the speech of actual human beings. Sam and Charlotte's attempts to figure out whether they have a future, on the other hand, are much truer and more poignantly scripted. Interest in the overall plot tends to rise or wane, depending on who is being focused upon at any given time. Even in its worst moments, though, Love the Coopers is very well-acted. Everyone delivers a good, engaging performance. The MVP is Olivia Wilde, who manages to imbue Eleanor with a rebellious streak that masks some deep insecurities. She's terrific, perhaps best exemplifying what the movie is trying to accomplish in its theme of figuring oneself out. When all is said and done, Love the Coopers is significantly flawed, but it also contains enough ambition to rise slightly above the norm for this sort of thing, despite the dumb jokes about dog farts and swearing children. As the old saying goes, it's just good enough to make you wish it was better. 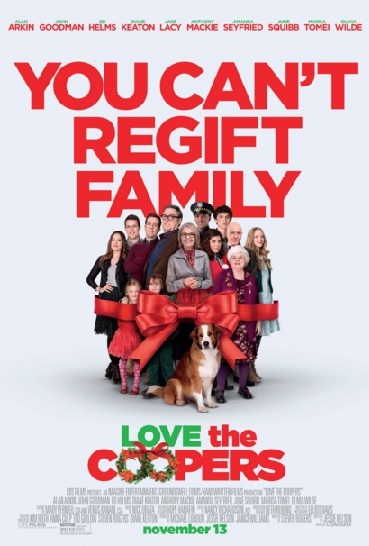 Love the Coopers is rated PG-13 for thematic elements, language and some sexuality. The running time is 1 hour and 46 minutes.